To get more quality backlinks from OnlyWire, RSS feeds can be helpful. With an account on OnlyWire, one can add up to 3 feeds. With a maximum package, it is possible to have an unlimited feed addition package. The best part, though, is that when one adds their blog post feed, YouTube or Facebook page feed by updating their status, all the updates will be seen and shared on all of the Social networks on OnlyWire. In short, if one does a blog post, turns it into video and posts it on Facebook, then all three of those platforms will get backlinks. They all connect to one’s content if they set their posts up properly with their link. This means there will be 35 backlinks to blog, the YouTube Video, and the fan page on Facebook. All this happens without the user having to manually do it, on autopilot, so to speak. All one has to do is set it up the first time and forget about it. The most obvious advantage of OnlyWire is the ability to auto-syndicate content to several networks for quick backlinks. This is extremely helpful for long tail keywords, and might even rank one on keywords in some market segments. It is popular and can be able to connect with many other online blogging tools. However, for those who blog daily and wish to take advantage of its benefits, the cost of the maximum package might be a little costly. OnlyWire is a monthly submission limit type tool. Whenever one submits a single link to a social account, a point counts towards the monthly limit. With every payment every new month, the limit replenishes itself. Depending on one’s level, having many tools raises the number of submissions closer to the limit. Another major advantage is the convenience. It takes time to set up social media accounts. Depending on the number of available accounts, it might take as long as two hours. However, after setting up, one does not have to do it again. Among the most popular social media sites offered in OnlyWire are Twitter, LinkedIn, Google Plus, Facebook and so much more. It also has social bookmarking sites like Reddit, Delicious, Stumbleupon and Google Bookmarks. There are two ways to use this tool. One way is through the use of the platform, and another is to download and install the submitter. After doing this, the user will not be required to log into their OnlyWire account every other time. All they have to do is click on the icon and a small window will appear from where they can manage accounts. 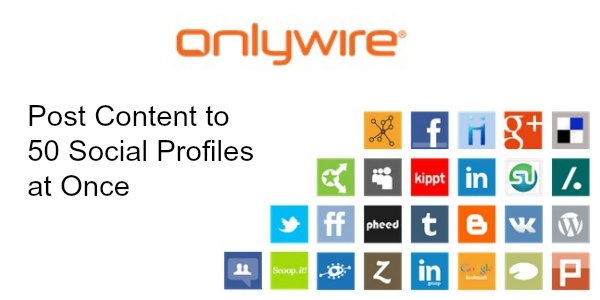 OnlyWire offers a user the capacity to have it post content for them in an automated manner. This ensures that a user can be able to schedule content that needs to be posted and facilitating the same to the tool. With that aspect covered, the tool is able to have the posting process automated to give a user an ease of operation and a reprieve when it comes to posting the content. This tool is able to perform reporting and analysis on an enhanced platform which means that backlinks are evaluated and classified according to the impact they make and how effective they are in driving traffic. With that, it becomes easier to point out the unhealthy links and unprofitable linkages which are normally read out as spam links by search engines like Google. The dedicated support that is ready to aid users get the best experience from the software gives advice and technical support as and when needed. This gives users the ability to enquire and ask questions and queries concerning the working of the tool and ultimately get answered with ease. This is one of the advanced upsides to having the tool since it is able to facilitate a setting whereby sharing of content is made multifunctional and in an orientation where it can surface in varied platforms automatically. This relieves a user from having to address each social platform separately which saves time and resources that would have been spent on the same. With OnlyWire, users get to have their submissions branded by the site name or the brand they choose for the same. This ensures that anyone who is able to view the submissions gets to identify with the brand which is a strategy that builds traffic and increases the appeal that people can have on the site. This achieves the objective of SEO seamlessly. With the tool, individuals get to have a multiuser setting that allows logins and operations in an enhanced manner. This creates ease of accessibility and also cements the aspect user efficiency. The same service set up that is being offered by OnlyWire is offered for free by other platforms like the WordPress plugins which makes it a costly path to achieve social media integration in the marketing process. If unchecked and uncontrolled, submissions that are made by the tool can easily clog the social sites which may lead to the owners and users of the sites to have a negative perspective of what the tool and its service is all about. This may lead to a counterproductive state where instead of driving traffic to sites, it does the opposite and drives people away from the sites.